This initiative offers people who love to cook an opportunity to cook for a larger number of people then let’s say only their wife or husband. Mostly older people in our neighbourhoods are cut off from society, because off the individualization. In this environment there are not many activities for them. The people who started the solution want to make friends, be socially active and create a backup in case one of them would lose their job. They love to cook and want to offer a cheap alternative for people that go out for dinner, so that it is affordable for everyone. The ‘Living Room Restaurant’ is an occasion for people to have a cheap dinner and to meet other people, located in the residence of the solution providers. After reservation via email or a phone call, people can literally come and sit at the dining table with the residents. After a short chat and getting acquainted with all the guests, dinner is served. The dinner consists of two appetizers, head course, dessert and unlimited drinks. Guests can choose which music they want to play in the background and only have to help with clearing the table between each dish. The providers sit on the ends of the table and between the dishes they switch places so they can talk to everyone who is present. It depends on the cheerfulness how long the evening lasts and after it you have to pay 15 euros. The guests can pick a chewing gum while taking their coats. This is a very interesting innovation since it brings people of our society back together again in their own environment. There are similar other restaurant like this set up recently in Holland, according to a local newspaper, and that is also what the providers think. However none of the people that were in the restaurant when we visited have ever been to a similar restaurant, but some of them did hear from other restaurants like this. The ‘Living room restaurant’ only started 2 months ago and it’s clearly still in its initial stage. The people are not sure whether they should continue the project, or not. As it looks now they still like the cheerfulness of it, but if that changes they won’t hesitate to stop, because it’s just a hobby of them. They do have a clear idea of what they want in their restaurant, and they’re not testing drastically other set-ups. Each time the providers organise an evening around 10 people will visit. Each one of them has to pay 15 euro, for their own meal and that of the providers and the unlimited drinks. The providers of the solution don’t make any profit on it, nor do they lose money on it. They shop in regular supermarkets and they do not need a permit for the restaurant since it is a small-scale setup. The values and benefits for society are modest. The Living Room Restaurant doesn’t attract a big audience, because poeple are a bit afraid of going to personal places they don’t know. 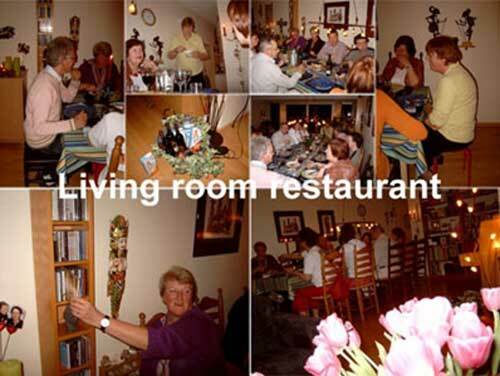 People can also go to the living room restaurant in groups, but that is not the purpose of it. On an individual scale, the benefit can be a lot bigger, because people could meet new friends there while being themselves or at least have a nice evening. The intention is host new people every time a dinner is organised and that almost nobody knows one another. The values and benefits for the environment are modest too, maybe non-existing. People have to come to the residence with a car or bike. However, they do not have to make dinner themselves. There are no significantly environment friendly benefits or disadvantages for this kind of restaurant. Values and benefits for economy are there. People with lower income can go to the restaurant and have a nice meal for a modest prize. The initiators of the project don’t make any profit out of it.